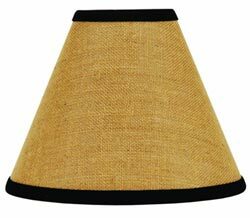 We carry the complete line of country, primitive, and vintage style lamp shades made by Raghu, in all sizes - most styles come in 6 inch, 10 inch, and 12 inch, plus some 14 inch, 16 inch, as well as drum shades in 10 inch, 14 inch, and 16 inch. We keep some stock on hand, but most are special ordered, which allows us to offer you Raghu's complete collection. Please allow approx 3 weeks for special order items to arrive to us before shipping out to you! 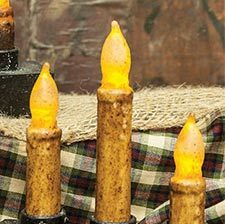 Also, an assortment of silicone dipped candle light bulbs, lamps, torpedo bulbs, LED candles and branches, night lights, and anything else we might have that lights up! 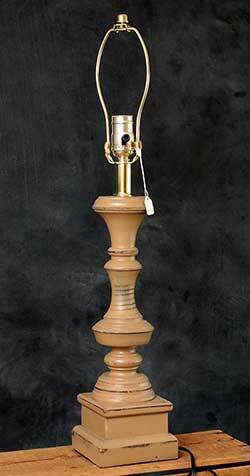 Bingham Lamp Base, by Raghu. 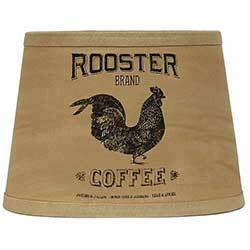 Made of wood with a painted and lightly distressed finish. 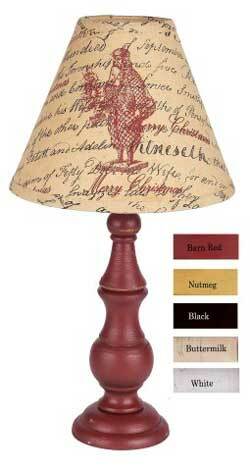 Available in Black, Barn Red, Nutmeg (a yellow/tan color), Buttermilk, and White. 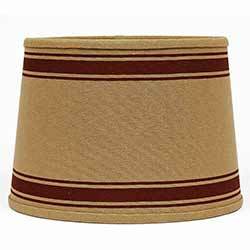 Measures 12 inches tall (to the top of the socket) and 4.75 inches wide at base. 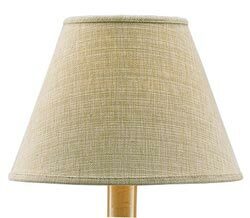 Shade sold separately (we recommend a 10 inch size). 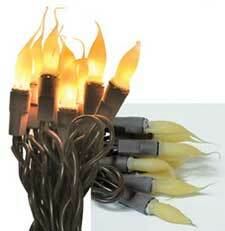 We love the welcome and inviting look of one of these lights perched in each window of a house, or on a shelf! This is the 4 inch size, with blue base. 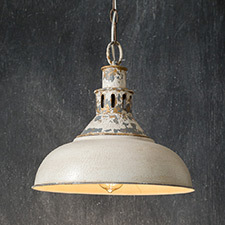 We love the welcome and inviting look of one of these lights perched in each window of a house, or on a shelf! This is the 6 inch size, with blue base. 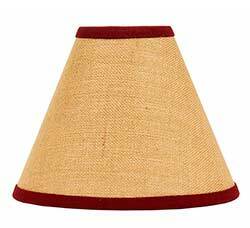 Brossac Round Lamp, by Light & Living. 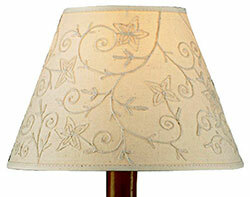 This shabby chic style lamp is made of carved, painted, and distressed white in an antique white. 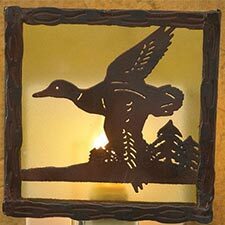 Measures 14 inches tall, and 5 inches wide at the base. 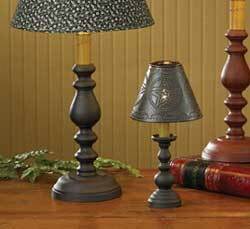 Use with a clip-on style shade, or a ring clip (shades that have a washer ring that rests atop the top socket of the lamp, and the black screw-on piece secures the shade). 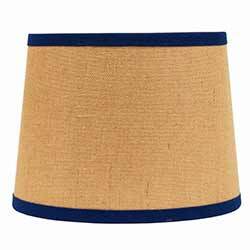 Bryant Accent Lamp Base, by Raghu. 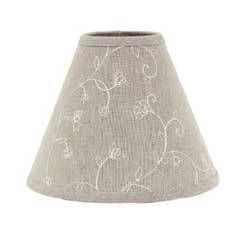 Measures 14 inches tall (not including bulb or shade), 4 inches wide at base. Made of metal. Color is black. 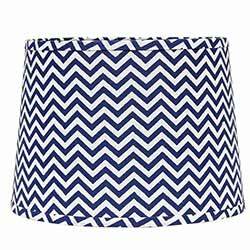 Lampshade sold separately - requires a 10-12 inch clip-style shade. 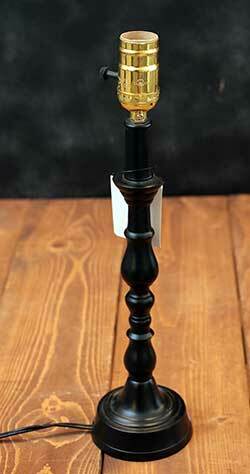 Large Black Candlestick Lamp Base, by Park Designs. 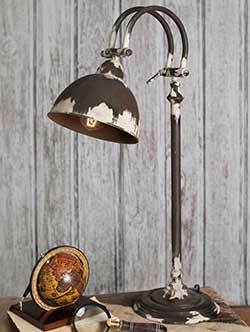 Classic candlestick-shaped lamp, made of a primitive, rustic cast iron. This is for the Black lamp in the large size. 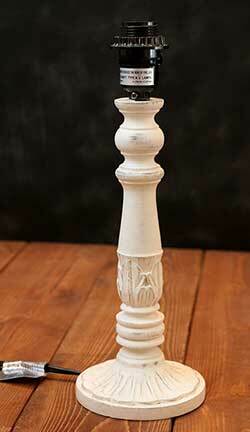 Measurements: 6 inch diameter base, 23 inches tall (to top of socket). This is for the Lamp only - shade is sold separately (we recommend a 14 or 16 inch size for this lamp). 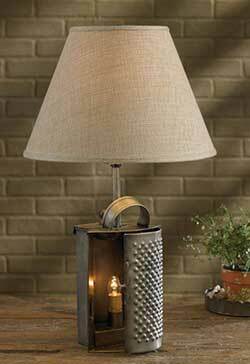 Covington Lamp Base, by Raghu. 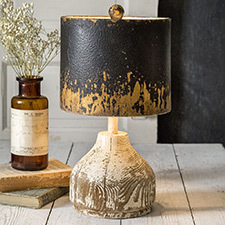 Made of wood with a painted and purposefully distressed finish. 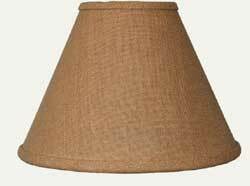 This is for the NUTMEG lamp, which is a honey-colored tan. 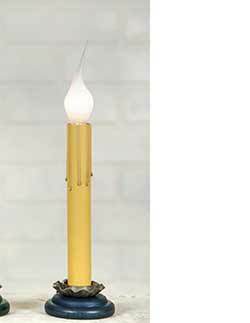 Measures 16 inches tall from base to the top of the socket (harp adds another 6 inches, so total height of lamp is 22 inches). 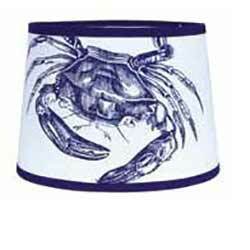 Measures 5 inches wide at base. 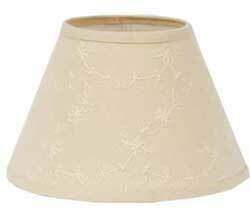 Has a harp for a washer-style shade, but harp can be removed to reduce height and/or use with a clip-on bulb. 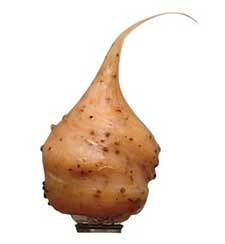 Shades sold separately - we recommend a 14 or 16 inch size. 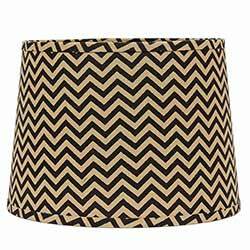 Ellie Rose Lamp Shade, by Raghu. The Ellie Rose Collection features a pretty, shabby-chic style cotton fabric with a peony rose in pinks and sage green leaves against a cream colored background. 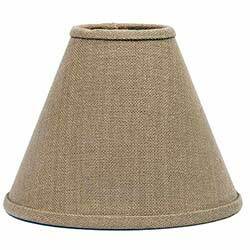 This is for the 14 inch DRUM-style shade. 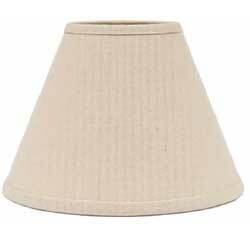 Measures 12 inches across the top, 14 inches across the bottom, and 9.25 inches high. 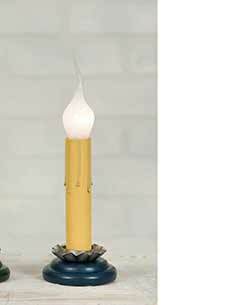 Attaches via washer top to a harp-style lamp. 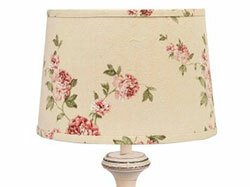 Emily's Floral Drum Lampshade, by Raghu. 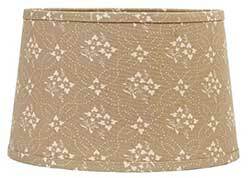 The Emily's Floral Collection features a slightly floral, slightly geometric pattern in cream against an oat colored cotton background. This is for the DRUM shad.